We’ve all seen some variation of schizophrenia depicted in the movies, whether it’s Russell Crowe tormented by mathematical equations in A Beautiful Mind, or Jake Gyllenhaal as the titular character in Donnie Darko, believing he’s living in a tangent universe accompanied by Frank the Bunny. But these movies, while fascinating to watch, aren’t real life for most suffering from schizophrenia. So, what does schizophrenia really look like, and how can you help a loved one you fear may be suffering? Schizophrenia, which impacts more than three million American adults, affects how someone feels, thinks, and acts. A person with schizophrenia may no longer make sense when they once had, or they may sit, silent and motionless, for hours at a time. Maybe they hear voices, and are compelled to act upon what the voices are telling them to do, no matter how nonsensical or dangerous those actions may be. The cause is still unknown. 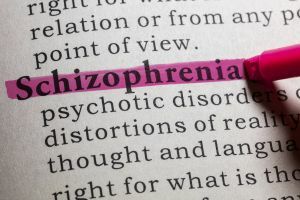 Scientists are still speculating whether schizophrenia is genetic, environmental, or caused by an imbalance in the brain chemistry – they have found incidences of all of these. The disorder tends to run in families. The chemicals involved with this disorder are dopamine, glutamate, GABA, and serotonin. People with schizophrenia don’t always experience the same set of symptoms, or develop the symptoms at the same age. Those with schizophrenia usually begin displaying symptoms as a teenager or young adult. There are different levels of severity. Schizophrenia used to be categorized into four different subtypes. Now, it is just termed as schizophrenia with different levels of severity. Schizophrenia with prominent mood symptoms is classified as schizoaffective disorder (co-occurring schizophrenia and a major mood disorder). Nearly one-third of people with schizophrenia will attempt suicide. According to PsychCentral, people with schizophrenia who are suicidal are less likely to share their suicidal intentions, making it difficult to intervene and help. It’s important to be extra in tune with your loved one and their needs. It can be scary, but there is help. Treatment can lead to better outcomes for those with schizophrenia, especially if sought early. Encourage your loved one to see a medical or mental health professional immediately. A combination of medications and therapy can help those with schizophrenia live productive and meaningful lives. Remember – your loved one is a person and not their illness. They are still the person you know, and their illness does not define them. Have you had experience with a loved one with schizophrenia? What have you learned that could help others? Share your tips and recommendations in the comments below.